, senior tiger program director for Panthera, the global wild cat conservation organization. Tiger numbers suffer from “a lot of hype,” Goodrich said. That’s partly because tigers often live in some of the most remote and difficult terrain in the world. An expedition I participated in found tiger pugmarks at 10,000 feet in the Himalayas of Bhutan, at a time when outside biologists refused to believe Bhutanese reports of high-country tigers. The Bhutanese later proved it with camera-trap images from 13,450 feet. Goodrich said the 1999 estimate of a worldwide population of 5,000 to 7,000 tigers was “a guesstimate,” and the 2010 count of 3,200 was also just a guess. “Now our data are much better,” he said, mainly due to improvements in tiger monitoring, camera trapping, and the complex algorithms for inferring total populations from the reliable data. “But there are still only two countries that have comprehensive surveys of tiger habitat: Nepal and Bhutan,” Goodrich said. Despite his concerns with the WWF report, Goodrich acknowledged some good news, including increases in tiger populations in the Western Ghats mountain range in India, around Chitwan National Park in Nepal, and at the Huai Kha Khaeng Wildlife Sanctuary in Thailand. Habitat destruction also continues unabated. The host of the New Delhi conference that wrapped up Thursday was Prime Minister Narendra Modi, the most pro-development, anti-nature prime minister in India’s recent history. He gives lip service to tiger conservation—but with his strong backing, India appears to be going ahead with a road-widening project between the Pench and Kanha Tiger Reserves in central India—the setting for Rudyard Kipling’s Jungle Book. That decision goes against the conclusion by a Supreme Court–appointed advisory committee that the project would cause “irreparable damage to a critical wildlife habitat.” Modi’s administration is making such choices everywhere. So much for happy talk and good publicity. What politicians and conservation activists need to be hearing from the entire world is a loud reminder that continuing on our current course will cause tigers to disappear forever from the wild. This entry was posted on April 15, 2016 at 8:31 pm	and is filed under Conservation and Extinction. Tagged: hype, India, tigers, WWF. You can follow any responses to this entry through the RSS 2.0 feed. You can leave a response, or trackback from your own site. Science writers everywhere seem afraid to write about this misrepresentation (lies) about the scientific data, or is fact checking now dead too? Thank you for writing this. Nobody fact-checks internet stuff, and more and more journalism is moving to the internet. Also the pay is so bad that the people writing these stories often cannot afford the time to check out a story with a second or third source. It’s a sorry state of affairs. I used to write American Scene pieces for Time Magazine in the 1980s–1500-1800 words for $3000. Recently I offered the magazine a piece of about the same length, and then they told me the price: $50. I laughed, and took it elsewhere, but many writers don’t have much choice. 1. Having devoted years of our lives to trying to understand and save wild tigers, we believe their conservation should be guided by the best possible science. Using flawed survey methodologies can lead to incorrect conclusions, an illusion of success, and slackening of conservation efforts, when in reality grave concern is called for. Glossing over serious methodological flaws, or weak and incomplete data to generate feel-good ‘news’ is a disservice to conservation, because tigers now occupy only 7% of their historic range 2. A recent World Conservation Union (IUCN) assessment3 showed 40% habitat loss in the last decade, and a spike in poaching pressure in many regions. Cambodia, Vietnam, Lao PDR and China have virtually lost viable tiger populations in recent years. This is not a time for conservationists to take their eyes off the ball and pat each other on the back. strong political, administrative and public support rarely matched anywhere else. 3. Such sporadic tiger recoveries should be monitored using statistically robust camera trap or DNA surveys. Rigorous scientific studies in India, Thailand and Russia4-6 demonstrate this can indeed be done. But these studies also indicate that tiger recovery rates are slow and not likely to attain levels necessary for the doubling of wild tiger numbers within a decade4-6. 4. Estimates of tiger numbers for large landscapes, regions and countries currently in vogue in the global media for a number of countries are largely derived from weak methodologies7-9. They are sometimes based on extrapolations from tiger spoor (tracks and droppings) surveys, or spoor surveys alone. While spoor surveys can be useful for knowing where tigers occur, they are not useful for reliably counting their numbers. Translating spoor counts to tiger numbers poses several statistical problems that remain unresolved9, which can lead to fundamentally flawed claims of changes in tiger numbers7-9. tigers survive within these source sites. They are recovering slowly, only in some reserves4-6 where protection has improved. Outside these source sites lie vast ‘sink landscapes’, which are continuing to lose tigers and habitat due to hunting as well as rural and developmental pressures. 6. With the above considerations in view, even taking these putative tiger numbers at face value, simple calculations show that doubling of the world’s tigers in ten years as hoped for in the report1 is not a realistic proposition. Assuming 70-90% of wild tigers are in source populations with slow growth4-6, such an anticipated doubling of global tiger numbers would demand an increase between 364-831% in these sink landscapes. We believe this to be an unlikely scenario. 7. Rather than engaging in these tiger number games that distract them from reality, conservationists must now focus on enhancing and expanding recovery and monitoring of source populations, while protecting their remaining habitat and their linkages, all the while being guided by the best of science. 2. Walston J, Robinson JG, Bennett EL, Breitenmoser U, da Fonseca GAB, Goodrich J, et al. 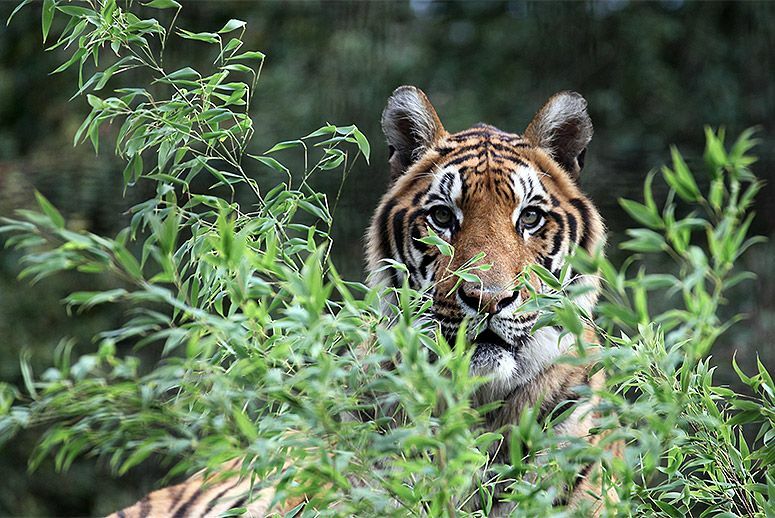 Bringing the tiger back from the brink—the six percent solution. PLoS Biol. 2010;8: e1000485. 4. Karanth KU, Nichols JD, Kumar NS, Hines JE. Assessing tiger population dynamics using photographic capture-recapture sampling. Ecology. 2006;87: 2925–2937. 6	Miquelle DG, Smirnov EN, Zaumyslova OY, Soutyrina S V, Johnson DH. Population dynamics of Amur tiger (P. t. altaica, Temminck 1884) in Sikhote-Alin Zapovednik: 1966-2012. Integr Zool. 2015;10: 315–328. 7	Karanth KU, Nichols JD, Seidensticker J, Dinerstein E, Smith JLD, McDougal C, Johhnsingh, AJT, Chundawat, R, Thapar, V. Science deficiency in conservation practice: The monitoring of tiger populations in India. Anim Conserv. 2003;6: 141–146. 8	Karanth KU. India’s Tiger Counts: The Long March to Reliable Science. Econ Polit Weekly. 2011;XLVI: 22–25. Curious. Wondering why the tiger folks mentioned it positively. Will try to follow up. I really doubt that Vietnam has any tigers at all, let alone 5. Same for Laos and Cambodia. Totally gone from those 3 countries and in big trouble in Sumatra. WWF-Cambodia already released a press statement confirming that tigers there are now functionally extinct in the wild. Tigers in Malaysia are also getting completely hammered by poaching – and, to a lesser extent, road development. Things are definitely not looking good. The recent announcement by WWF and Global Tiger Forum needs to be examined carefully. 1) No backup in the form of a detailed report or a specific account of the methodology employed in the estimate has been published. 2) The 2014 all-India estimate of 2,226 tigers has been mechanically adopted without question or comment. 3) The NCTA stonewalling style in India has been imitated wholesale by WWF/GTF–after the announcement of a 30% increase in January 2015, the NTCA declined to publish a detailed report (as it had done in 2006 and 2010), and it never made available the 1,500+ photographs it claimed to have taken of individual tigers in the course of the estimate. In short, Dr. Rajesh Gopal, then Member Secretary of the NTCA, behaved far more like a politician than a scientist–and he seems to be doing it again as a high-ranking official of the GTF. Our experiences over the past 27 years in Kanha for 3 months a year — not to mention the recent tragic events of tiger losses in Pench (M.P.) and the recent poaching update by WPSI — make us very doubtful indeed of the WWF/GTF/NTCA estimates, and it is very peculiar that the BBC and National Geographic would accept such claims so readily–particularly considering the objections of such respected experts as Ullas Karanth. I just returned from a week in Pench, and the road widening project is disturbing. At places along the road it appears that it’ll be as wide as an eight lane super highway. It also appears that they’re putting in overpasses (?) as well in a few key villages. If one has a chance, pick up Valmik Thapar’s most recent work: Saving Wild India: A Blueprint for Change.